We have recently received reports of a phishing scam that appears to come from IT Support, with the title "IT Services". The body of the email says "We noticed a login to your University Email account from an unrecognized location ..." (see example screenshot). It suggests you "CLICK HERE" if the login attempt was not made by you. This email is a fraudulent attempt to gain access to your personal information. What if you already clicked? If you clicked on the link and submitted any personal information (McGill Username and Password), change your McGill Password as soon as possible. See the McGill Password Reset Checklist for instructions. 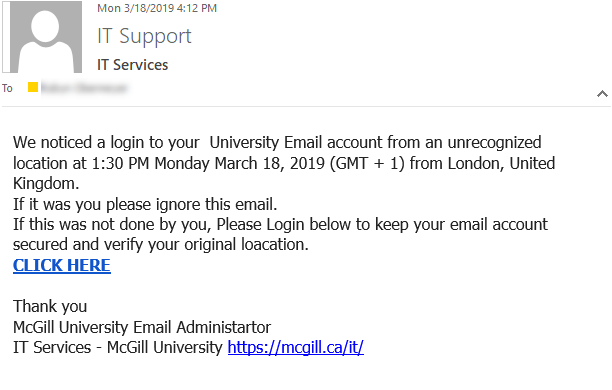 Send a message to phishing [at] mcgill.ca (subject: Report%20a%20phishing%20scam, body: Attach%20the%20suspicious%20email%20to%20this%20message.) with the suspicious email as an attachment.